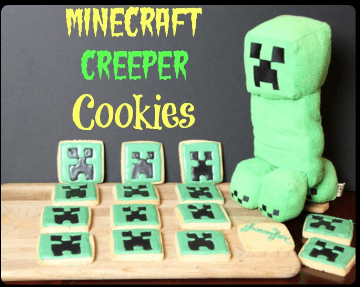 I have a few easy Minecraft creations that I have a feeling you will loving just as much as I do! My daughter has a slight addiction to Minecraft. 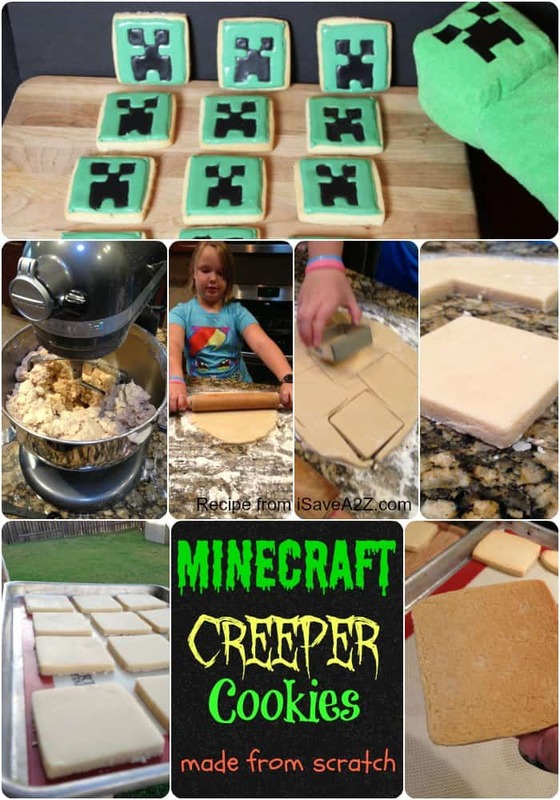 She wants her next birthday party to be a Minecraft theme too! 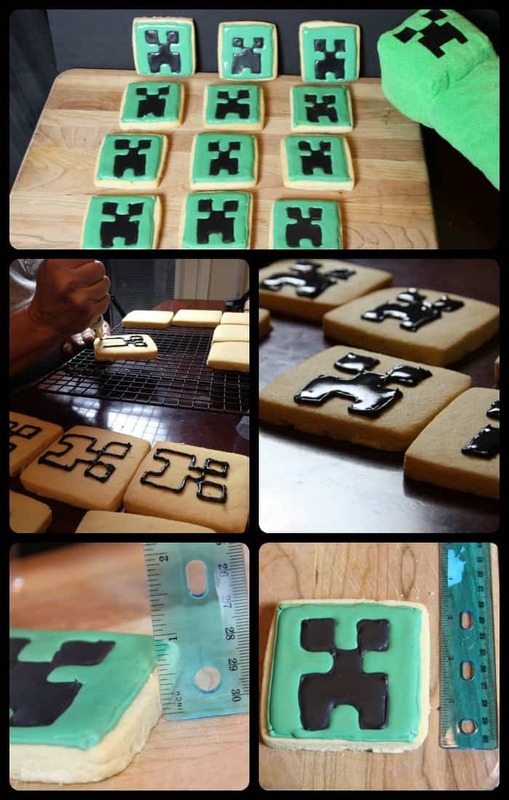 We started off making some easy Minecraft Sugar cookies using this amazing and super easy sugar cookie recipe here. 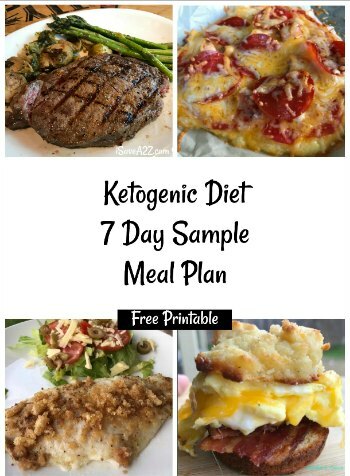 This recipe is one of my absolute favorites ever! I use this recipe every time I decorate cookies because it holds it’s shape nicely and it’s not that sweet. When you use royal icing you want a sugar cookie that won’t be overpowered with sweetness. It’s a perfect combo! There are a few tricks to making these cookies that I want you to know. First, don’t be intimidated. Really. 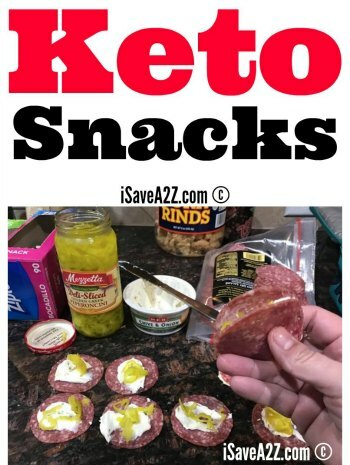 I consider these an easy project. I taught my 8 year old how to do it and if she can do it, so can you! First, start with a good sugar cookie recipe. This will be the success of your project. Next, have the proper tools. For this tutorial I used a 3 ” square cookie cutter. I highly suggest using the metal kind and not the plastic ones. If you have a steady hand you could also create a paper template and use a knife to cut around your template too. I like big and thick cookies so these are 3 inches and nearing a 1/2 inch thick. Rolling out your dough will determine this. If you’ve ever worked with Royal Icing, you know there are tricks you must know. Start with a good Royal Icing recipe found here. Make sure you make your cookies and they have cooled before you start making your royal icing. Royal icing is the type of icing that dries hard which is what you need when you are going for design work on a cookie. After you make and color your icing be sure to place a moist towel over it without allowing any air to get to it. If air get’s to it, it will be a bowel of cement before you know it. Outlining and flooding your sugar cookies. Here’s a good visual photo of outlining and flooding your sugar cookies using royal icing. It also helps when you can see it in a video so I created a very short YouTube video so you can see the consistency of the royal icing and see exactly what it looks like when you apply it. Flooding your cookies simply means that you have created an outline and you are using a more watery icing to create a flood within the outline your created. This will make your cookie look smooth and stay in place once it dries. I would allow your cookies to dry for a few hours before wrapping them. UPDATE!!!! 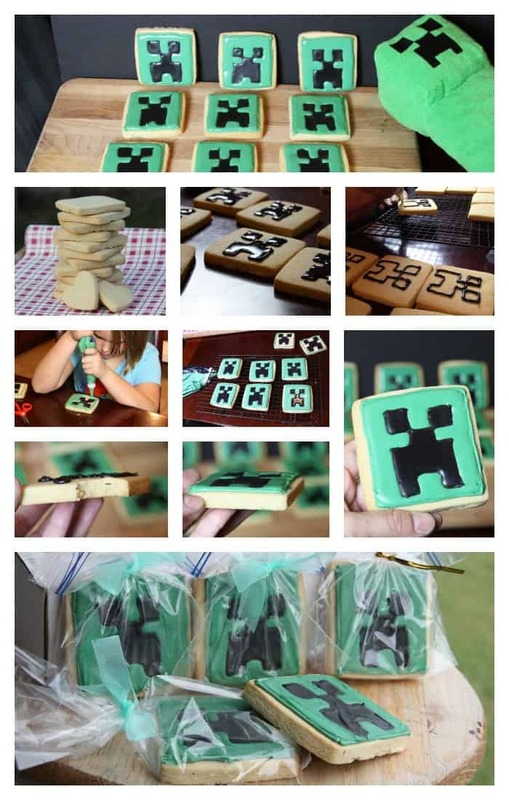 They finally came out with some Minecraft Cookie Cutters !!!! This is exciting!! Here’s my favorite tip for the royal icing tutorial. Use disposable icing bags. You will be very thankful you did this because the clean up is a pain! TIP: I always bake my cookies with this Silicone baking mat set and the cookies always come out perfect every single time! It’s a MUST! We’ve also made a DIY Minecraft Creeper Shirt tutorial made from freezer paper. My daughter is eight and she practically made this shirt herself (with my supervision of course), but my point is that it’s really easy. I see a ton more freezer paper crafts in our future! You don’t want to miss these super cute Minecraft Sunglasses too! 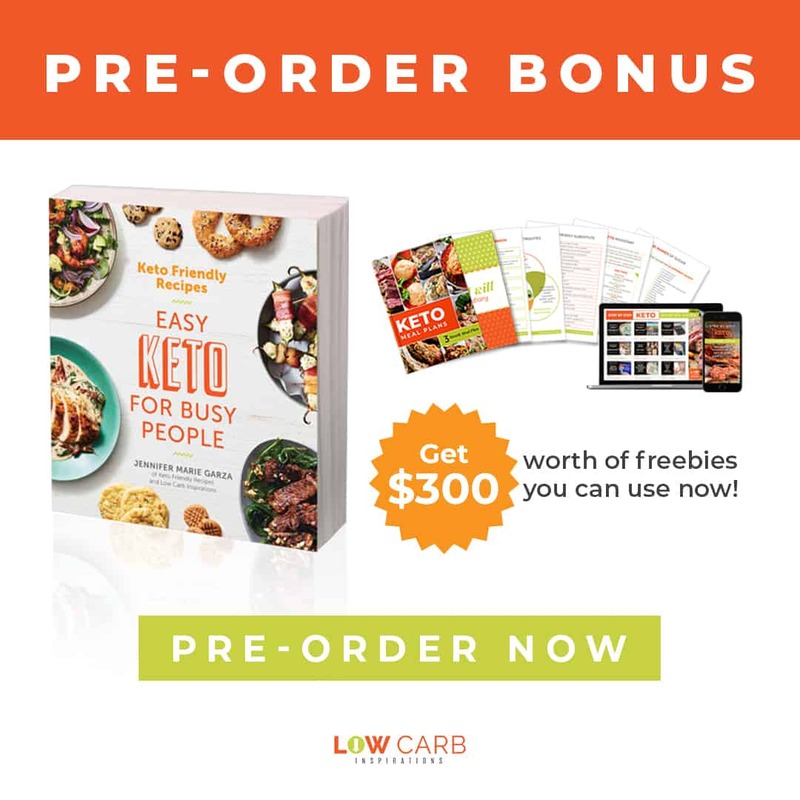 I found a deal on Amazon! Oh yeah! 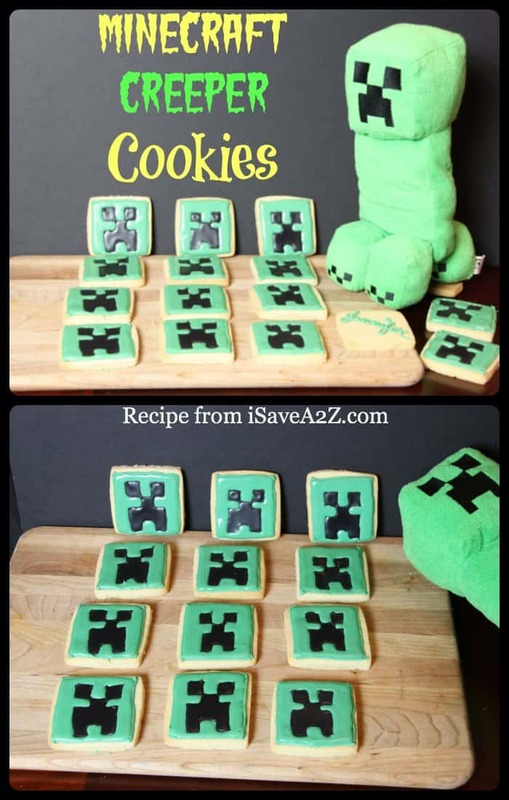 We enjoy all of our Minecraft creations and we hope you do too! So now the big question… what do you plan on making??? 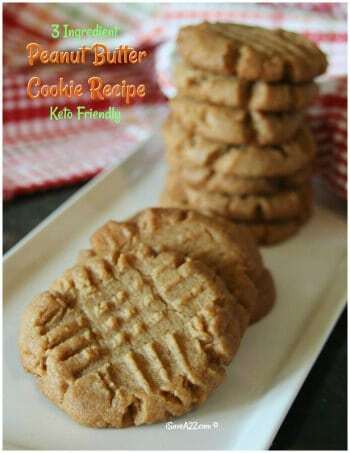 By Jennifer on September 8, 2013 Crafts, Desserts, Popular Posts, Recipes.